How to Leave a Garden Legacy? “Abandoned Garden” copyright by David Irons. Used with permission. We gardened as if we would be there forever, in an immediate pleasure in the moment that seemed to imply an inexhaustible future. Little of what we did there then remains, though the daffodils must, and that thought is very pleasant to us. I came across this quote today and I know it is going to be haunting me for days and weeks to come. Only a select few gardens are preserved and maintained after their owners pass on. Since we know our gardens will almost certainly change beyond recognition once we leave them, in what other ways can we leave a garden legacy? Photographs? Diaries? Teaching? Writing? Seed saving? How do we leave traces of our passion? 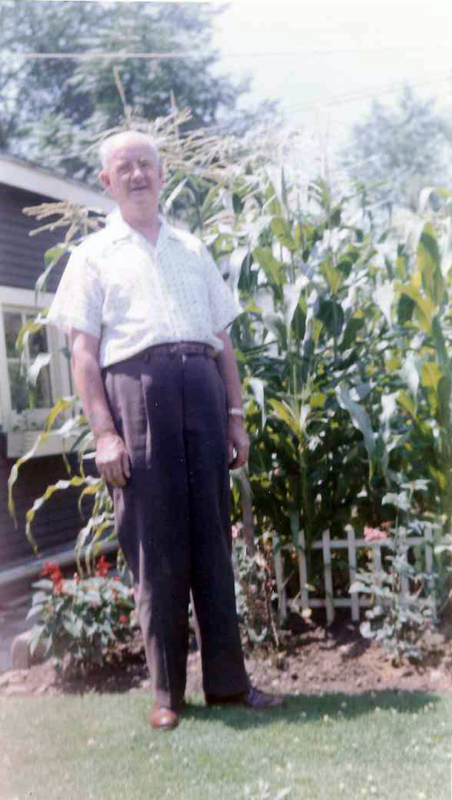 This is a picture of my grandfather, who grew wonderful flowers and vegetables in his small urban lot in Detroit. It was taken in July of 1959. He died long before I was born. A few years ago I asked my mother what kinds of flowers he grew. “Hmmm, roses and peonies. Oh and dahlias, I think,” said my mother. At the time I thought: too bad, those aren’t really my thing. But in April of this year I found myself curiously, unexpectedly, drawn to roses. In April I planted a bareroot ‘Therese Bugnet’ in my side yard. And I’ve been pausing over the dahlia pages in nursery catalogs. The garden is a habitat of mighty forces, and I’m not just talking about photosynthesis. This entry was posted in ruminations and tagged garden legacies, joe eck, our life in gardens, wayne winterrowd by Mary Gray. Bookmark the permalink. It’s funny you write this…I was just thinking about this last week and decided to do something about it. I started a garden journal complete with a map of all the plants in it and when they were planted. I’m hoping I’ll remember to take notes all along and all that jazz and pass along the notebook to the new owners in the event the house ever gets sold much like Beatrix Ferrand’s ‘Plant Book for Dumbarton Oaks’. Yeah I know what you’re thinking and yes, I *am* the coolest 26 year old on Earth for having enough time to do this. Or you might inspire them to become gardeners themselves…so that, even if they changed everthing you did, you’d still have been a great influence. Ooo I like this optimism! Mary, I used to keep a garden journal when I first discovered gardening. I still have a couple of notebooks around. But these days I find myself photographing my garden whenever I can – large views, vignettes of planting combinations – today it was closeups of a bouquet of peonies I just cut. The goal is to make a book of images of the garden, through its many iterations. I plan to start it more seriously when I leave my deign firm at the end of next year. Funny you bring up photograhy because lately I’ve been thinking about how so many gardeners become interested in photography *through* gardening. I guess because of gardens’ ephemeral nature we feel the need to capture moments that we know won’t last. I myself bought a rather expensive camera last fall in the hopes of documenting my garden but so far my results have been lackluster. Of course it looks like it should be so easy but then when I see *truly* great photographs I realize how lame mine are. I was actually thinking of doing a class through the Wash. School of Photography this summer. Anyway, I look forward to following your website and seeing where you go with your photography, Melissa. You do beautiful work. This reminds me of the years when I turned to landscape architecture mid-career. At the end of my training I sat one day and began a memoir of my mother’s garden. I sat down and drew a plan, nts. I then proceeded to place every tree, shrub and perennial. The huge beech that I used to climb with my sister when we were kids. The perennial border that was our ‘curtain’ for many outdoor drama’s and the huge azaleas in the corner that were always the ‘bad guys’ hideout when we played cowboys. So you see it doesn’t matter that we leave our gardens behind. We have a landscape of memory to carry with us as we move on. BTW, I could never out climb my older sister and our mother finally sawed off the lower limbs (sniff, sniff) in an effort to deter us. It didn’t work and now I’m glad that I don’t have to look outside to see that majestic tree missing it’s canopy. I remember it in its full glory. Beautiful, Linda. Thanks for sharing this story. Isn’t it amazing how the landscapes we inhabit as kids (no matter what they looked like) impress themselves so strongly on us? I love your idea of creating a memoir of your mother’s garden. Perhaps I will do the same…. I keep a file on my computer of all plants added to the garden by year. There are also two lists, perennials and shrubs/trees, and corresponding maps showing where the plants are on the property. Each list is numerical with the number indicating where it is on the map, and on the list is the name of the plant, and when and where it was purchased. I am hoping some great-grandchild may be interested in my garden evolution. Since I’ve had my genealogy done, and since everyone on my dad’s side dating back to the 1600’s is listed as a florist, gardener, lands keeper, or lands caper (yes, two words), I am pretty confident the genes will win out and some generation in the future may be interested. That’s fantastic, Nancy. I wish I were organized enough to create such a record. The only thing I do now is stick all my plant tags in one of those photo albums with the plastic sleeves, and every May I thoroughly photograph every part of my yard so I can see the progress over the years. I wish I had the self-discipline to do more! Thanks for writing such an eatstyo-unders-and article on this topic. Well that’s really not bad self-discipline there – I think about doing that every year, but don’t always get even that far. Going back a bit in the reply section, we did have an agreement, whether it was actually in the contract or not, when we sold our first house that I could come back and get divisions of any of the plants within the first six months or so after moving – and I did. As we didn’t immediately buy another house I was moving around lots of plants in 3 & 5 gallon pots for a couple of years, but most everything survived. And when several years later I was back in the are and drove by that house that had been our first home, there was a car pulled up over where one garden area had been and a pick-up in the middle of another. -sigh- But the Chinese windmill palm (Trachycarpus fortunei) was up above the house by a good 12-15 feet – at that point more than a little out of proportion but I loved that it at least was still there. I used to keep a detailed garden log and map of my extensive gardens. But that ended up being so much work as the plantings and design changed and evolved over the years. So I started doing what another commenter did. I took pictures! And pictures, and more pictures. Close-ups and full scenery. After 13 years, I no longer live in that home. But I have wonderful pictures of it to look at and still enjoy. I miss it terribly, but now I am in a new place with new garden space and new challenges to satisfy my obsession. After reading so many comments about people’s beautiful gardens being destroyed by subsequent homeowner, I’m glad that I’ve kept a written/drawn record of my gardens for posterity as I’m sure my garden will not survive either. Someone that I know that is certainly leaving behind a garden legacy is Jim Gibbs, retired President and founder of Gibbs Landscape Company, one of Atlanta’s leading landscape companies for more than 40 years. Jim has worked for more than 30 years to create a public garden on his estate in north Georgia and it recently opened in March of this year. Gibbs Gardens is comprised 292 acres and the house and gardens include 220 acres, making it one of the nation’s largest residential estate gardens. I recently visited the garden and I have to say it is absolutely spectacular – and well worth the hour drive from Atlanta! Interestingly, some of the English boxwoods in the garden were grown from cuttings that came from his grandmother’s family. “Passing down seeds and plants from generation to generation provides a kind of love that only a gardener understands. I’m sure my three children and eleven grandchildren will enjoy this garden for years to come as I hope the general public will enjoy visiting and viewing the legacy I leave behind,” says Gibbs. Mr. Gibbs’ passion for horticulture and his landscape architecture talents will certainly be remembered for many years to come through this garden legacy he has created! Of course, we all can’t leave behind a garden legacy such as this but it makes me stop and think about what I can do to pass on my love of plants to my family. I, just like Jim, was influenced by my grandparent’s passion for gardening. Some of my fondest memories of her are spending time helping her with her dahlias, peonies, strawberries and rhubard. If you’re in the area, I highly recommend seeing this world-class garden! To take an online tour of the garden go to: http://gibbsgardens.com/index.php. It starts with the passion that lives within and it is our duty to pass it along when we’ve been givin the “Gift” to garden and nurture to all those with the same gifts. I unfortunately have never had a great deal of money to creat the garden I’ve designed in my mind but I have learnded be in the right places at the right times for plants, soils, tools etc. I only wish I had a parent who was gifted in Horticulture or Landscaping so I guess at the end of the day what we leave behind is our foot print on the world.